A visit to Koh Samui is normally an ideal blend of time spent lazing around on the picturesque beaches, coupled with some adventurous forays into the neighboring islands. Formerly a small fishing community, this place been transformed into one of the most popular tourist destinations of Thailand, catering both to the cost-conscious as well as the as wealthy thrill-seekers alike. In Koh Samui, one can easily get spoilt with the choices, hence, the list of top attractions given here will help you see a lot of the island in an informative and complete manner. And, if, at the end of the day you are able to round off with some authentic Thai food and a glass of Samui’s own Magic Alambic rum, then you really have it made. Are you planning the ultimate Koh Samui vacations? Check out the following spots and activities. Jaw-dropping coastline scenery, fine dining, vibrant nightlife, and a multitude of beachside bars have made Chaweng, historically and literally, the best place to let loose in Koh Samui. The busiest and most bustling town has sprung up around Chaweng, housing beachfront outlets like small restaurants, bars to trendy and sophisticated cocktail lounges, catering to every taste. The nightlife, on Mango strip, is said to be streets ahead of any other place in Thailand. From an almost deserted bay, just 20 years ago, Chaweng has been turned into a vibrant and busy travel destination. The 5-km white sand stretch of beach is undoubtedly the most visited part of Koh Samui. 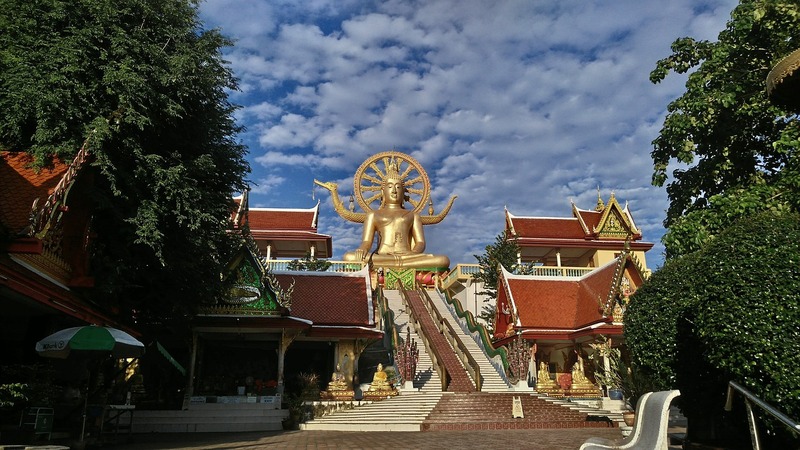 The Big Buddha Statue, or Wat Phra Yai, is without a doubt the number one attraction, both for the locals as well as for the tourists in Koh Samui. Simply paying a visit to this holy place is considered a trip well worth the money. People get awed at the sheer size and beauty of this amazing and magnificent golden structure which was erected in 1972. The impressive height of 12 meter makes this one of the most prominent landmarks of the island, offering great views to the passengers on all the incoming flights to Koh Samui airport. The place is thronged by devotees during the day while the statue lights up at night, with the many spotlights giving the place a feeling of a golden aura. 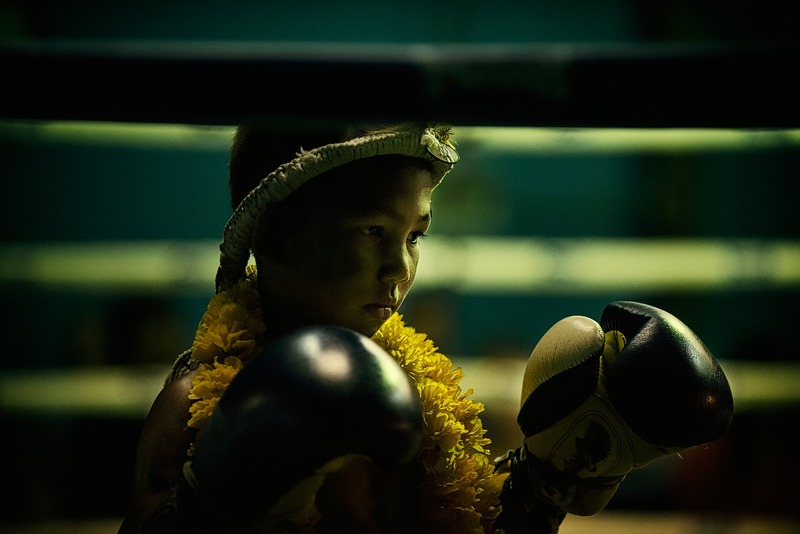 Koh Samui is considered to be the premier center of Muay Thai or Thai boxing in the whole country. Enthusiasts wanting to train and learn the finer points of this sport, flock here from every corner of the world. Koh Samui has an abundance of practice places and gyms, well equipped with all facilities, including accommodation and travel to the island. Irrespective of past experience, these popular gyms urge people of all ages to partake in this exciting sport. To get a real feel of what life on the Samui island is all about, just spend time at the elegant Fisherman’s Village near Bophut. The village has been, until today, painstakingly preserved in as much the true sense of what past life here was about, can be felt everywhere. Home to a large expat French community, the place has a Mediterranean aura about it, thanks to the presence of many old shops and houses made of wood. The village center is the ideal place to pick up souvenirs and gifts as presents to take back home. There are a number of good restaurants, eating outlets, and bars that are great for relaxing and taking in the great panoramic views of the sea. Designed by the well known Thai artist, Jarit Phumdonming, this colorful temple was opened in 2004 after three years of hard labor. The temple is home to some other religious sites as well, out of which the statue of the 18 arms Buddhist goddess, invariably hogs all the limelight. The surrounding environs of Wat Plai Laem, all display images which relate the life and teachings of Lord Buddha. The temple, on the whole, is very impressive and attracts a large number of tourists and devotees, who are drawn to the looks cast down by the statue of the goddess. Start the morning with a thrilling ride on a roomy three deck boat in the Gulf of Thailand, from Koh Samui to the fascinating Angthong Marine National Park. Spend thrill a minute moments snorkeling between the colorful reefs or kayaking along the coast. While at the park, do not forget to climb to the peak of Mae Koh island for some special views of the lagoon and the surrounding areas. Finally, give your feet a breather at the magnificent Wua Talap Island beach, where the white sand and the inviting water is just perfect for a swim. In addition, you can visit the nearby islands of Phaluai, Mae Ko, Sam Sao, Nai Phut, and Phai Luak and spend time at the many natural caves, rock formations, and lagoons in the emerald green water. Note: This is a guest sponsored post. Photos are taken from Pixabay. Wow, I have just arrived back from Thailand 2 weeks ago, and I wish I have read this before heading to Thailand. I’m actually not familiar with Koh Samui and I have just heard about it now when I read your blog. Truly, there’s more to see in Thailand like these stunning spots in Koh Samui. The authentic cultural experience at Fisherman’s Village is something I should not missed when I get the chance to come here. I will surely bookmarked this as I’m planning to get back to Thailand again soon. Thank you so much for sharing this with us Marj. Hey Marge. That’s quite a handful of places. I have never seen the buddha statue or the other temple you mention. I spent my time on Chaweng for most part, and then walked my way to Bophut at the fisherman’s village where I got myself a nice massage. 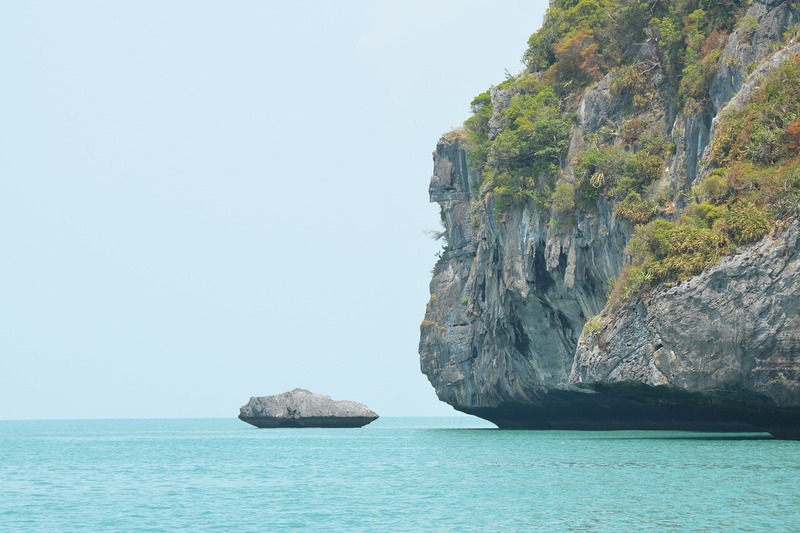 I did however do a couple of boat trips to Koh Nangyuan and Angthong (as you recommend). I liked this place called WaveSamui which is backpacker hostel with a beautiful library and host who welcome travellers to stop by and talk. Very informative blog. I’m planning to go on a trip to SE and I will surely add this place to my itinerary. Would love to see the lagoon from the peak of Mae Koj island. Koh Samui is now one of the more recognized destinations in Thailand. It is time that the Thais redefined their country and this is a right step. Kam Sui comes across as a charming place with some really serene experiences as well as action packed adventure experiences. 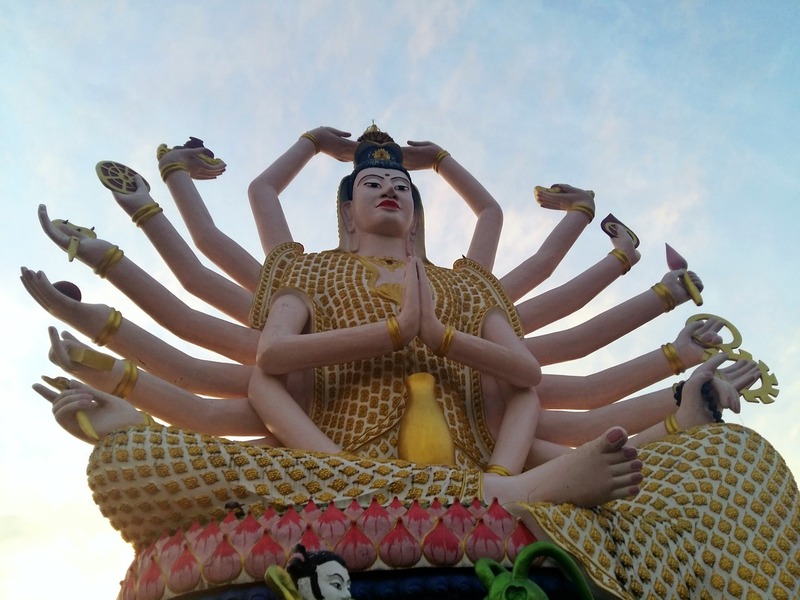 The 18 handed statue of the Buddhist Goddess is really fascinating. Of course the giant Buddha statue looks so awe inspiring. I would love to try my hand at Thai boxing when I get there! A nice list of things to do in koh samui. That buddha is really very big and I would definitely want to visit the temples for their unique architecture and the beach for its unique serenity 🙂 Thanks for listing these out. This is a must see once in Thailand, the photos are awesome! A glass of Samui’s own Magic Alambic rum wont be bad at all, I wonder how it would taste! The view of Angthong looks outstanding, impressively beautiful, a sure ride to hop on while in Koh Samui. Thanks for sharing! We also checked on this island before we finally decided to go to Koh Chang. Thailand has a spoonful of scattered islands here and there, it’s also nice to know the weather or season. If you don’t mind the rainy season, it’s also pleasant to go as there are less tourists. I’d like to see Wat Plai Laem temple here. The statue is enormous! In Russia, we have a lot of monuments, but they look small in comparison to this.